Image is used with permission under Creative Commons License CC BY-SA 2.0. We were all taught as little kids that mixing water and electricity is extremely dangerous. Maybe that is why I’ve always been fascinated with hydroelectric dams and the mysterious process of transferring water current into electric current. To me, it is amazing that the flow of water can be turned into the flow of electrons running down a wire. As a piece of music for euphonium and electronics, FLOW, explores these concepts by incorporating recorded water sounds and flowing melodies layered on top of electronic drum beats with intricate rhythms (the word rhythm comes from the Greek rhuthmos which is related to rhein, meaning “to flow”). The primary melodic material for the work is generated from the four letters in the word flow, which produce the pitches A, B-flat, E, F. This work was commissioned by Kenneth Kroesche, to whom I am deeply grateful for his support and friendship. Kenneth Kroesche is the Doris & Paul Travis Professor of Trombone, Euphonium and Tuba at Oakland University in Rochester, Michigan. He holds a master's and doctorate of musical arts degree in performance from the University of Michigan, in addition to a Bachelor of Music Education degree from Texas State University. 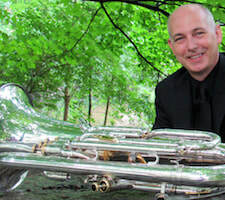 Dr. Kroesche has appeared as a euphonium soloist with a number of notable ensembles, including a guest appearance as a concerto soloist with the National Symphony Orchestra at the Kennedy Center for the Performing Arts in Washington, D.C. This honor was the result of a competitive nationwide audition sponsored by the orchestra and their music director, Mstislav Rostropovich. The Washington Post's review of this concert described him as "an expert on the instrument." He currently serves as the principal trombonist of the Oakland Symphony Orchestra and he is the solo euphoniumist of the Five Lakes Silver Band. Each summer, he performs as euphoniumist with the Toledo Symphony Concert Band and as a low brass player frequently performs with the Detroit Symphony, Flint Symphony, Toledo Symphony and Detroit Chamber Winds. The above prices include FREE shipping to the continental USA.